Geneva – IOM, the UN Migration Agency, reports that 16,089 migrants and refugees entered Europe by sea in 2018 through 8 April, with the vast majority arriving in Italy and the rest in Spain, Greece, and Cyprus. This compares with 33,355 arrivals across the region through the same period last year. IOM Rome’s Flavio Di Giacomo said Monday (09/04) that only one rescue operation was carried out over the weekend: the Italian Coast Guard rescued one small boat carrying a total of 104 migrants – all Tunisians – off the coast of Lampedusa. Di Giacomo added that, according to Ministry of Interior figures, 6,894 migrants arrived by sea to Italy this year: nearly 74.37 per cent less than the same period last year, when 26,902 migrant men, women and children were brought to Italy after being rescued in the waters north of Africa. However, despite fewer arrivals registered in Italy this year, the number of dead and missing in the Mediterranean Sea on the Central Route – although lower in absolute numbers (359 in 2018 versus 745 in 2017) – has increased relative to the number of arrivals by 75 per cent. This figure shows that the humanitarian emergency in the Mediterranean continues to remain a dramatic reality and that saving lives at sea is still the number one priority. 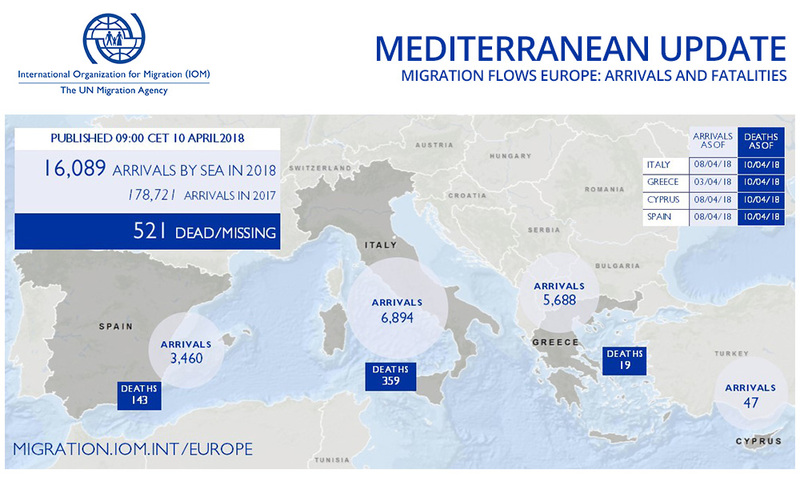 IOM Spain’s Ana Dodevska reported that 3,460 men, women and children have arrived in Spain across the Western Mediterranean in 2018, through 8 April. Worldwide, IOM’s Missing Migrants Project (MMP) has recorded 876 deaths and disappearances during migration in 2018. In the Mediterranean alone, 521 migrants are estimated to have died this year. The remains of four migrants have been recovered in the Western Mediterranean in the past 10 days. On 6 April, the remains of a man washed up on a beach near Tarifa, Spain – authorities believe that he wasn’t one of the missing migrants from the shipwreck on 1 April, as the body appeared to have been in the water for weeks or even months. Additionally, three bodies were recovered during the first weekend of April in Algeria’s north-western province of Ain Témouchent: on 31 March, the body of a migrant washed up on Plage Sbiaat; on 1 April, another body was retrieved in Iles Habibas; while on 2 April, the remains of a migrant were found 6 nautical miles off Port of Bouzedjar. On 9 April there were reports of a shipwreck off the coast of Morocco, 20 kilometres south the coast of Tangiers. There are believed to be ten survivors and six who died in this incident. It should be noted that these deaths will be recorded by MMP once further information is confirmed about this incident. There were two other additions to the Missing Migrants Project database since last Friday’s update. In Ceuta, Spain's enclave in northern Africa, a 16-year-old boy was run over in the port area on 6 April, as he was trying to cling to the undercarriage of a truck waiting to board a ferry bound for mainland Spain. On the US/Mexico border, the remains of an 18-year-old boy who drowned in the Río Bravo on 18 March were repatriated to his hometown in Nicaragua. Additionally, MMP received reports of the deaths of at least five Rohingya in the Andaman Sea last week. Survivors had been stranded for weeks in their boat and were rescued by Indonesian fishermen and brought to Aceh. IOM staff is gathering survivors’ testimonies to confirm the number of those who did not survive the journey.